Hello all, it is local news of members from Thailand. 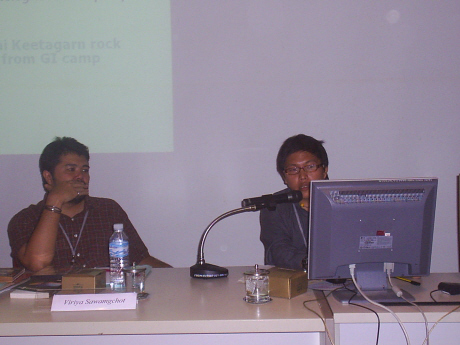 On January 11th, 2008 at 10th international conference on Thai Studies, Thammasat University, Bangkok Aj. 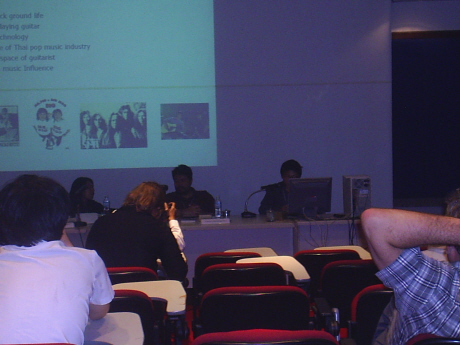 Ubonrat was a chair of “Thai rock music and its culture” panel which was organized by me. The theme of panel is to discuss of Thai rock music and its culture since the 1980s within the perspective of class, gender and generation. We have 4 panelists (including me) in the panel; (1) “Which Boat is Rockin? : Rock Music and Mass Politics in Thailand” by Viriya Sawangchot, Wathansala Centre for Cultural Studies. (2) “Not Anyone Can Play My Guitar: The Study of Thai Guitar Heroes since the 1980s” By Kachachai Wichaidit, Music 499 Academy (3) “Chiang Mai ‘Indie’ Music: Local Space and Its Changing Mind” by Viparat Panritdam, Chiang Mai University (4) “I Wanna Shout but Who Is Listening? 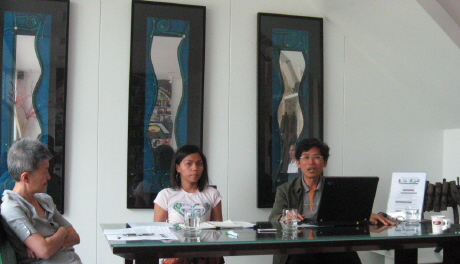 : ‘Thai Female Rocka’ and ‘His’ World” .by Siriporn Somboonburana, Walailak University. Exactly, all panelists never attend this conference before but Aj Ubonrat mentioned that it was the first time of pop & rock music panel in three decades of Thai Studies conference. Anyway, on October 27th, 2007, we had a prior one called “For Those About to Rock” were co-organized by Wathanasala and Music 499 Academy. In this informal meeting, we had a forum discussed by cultural researchers, music business men and professional musicians on rock music scene in Thailand since the 1970s and also had a live performing at the end of the day. Aj. Ubonrat was there and had a speech on opening as well.